IMPORTANT Shipping Information: TheViperStore.com Ships its Dodge Viper parts and accessories to North America, Europe and more. For Alaska, Hawaii, U.S. territories, Canada and Europe - You may check out using US Mainland Shipping Rates. Once we receive your order we will then invoice you for the extra shipping. We always try to consolidate overseas orders to save you the most money possible. To know what the exact shipping amount you may contact us be before you order - Please call or email us for amount of extra postage. 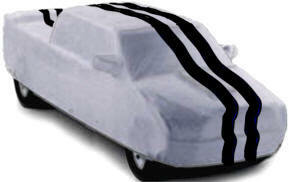 Coverking was overwhelmed after receiving test results of our latest design - Stormproof. 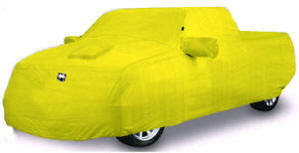 The culmination of over a decade of material engineering, it has only recently been possible to manufacture the microscopic yarns which go into this advanced micro-fiber Custom Car Cover material. Only one textile mill in the world was able to meet Coverking's specifications - and although challenged by Coverking's design, the results are truly a triumph for car cover users! Stormproof is UNCOATED and UNTREATED this means that even after months or years of use, it will have the same properties! Stormproof feels more like an expensive golf jacket, yet is tested to be the MOST WATER RESISTANT and (because there are no coatings) the MOST BREATHABLE. You can't go wrong with Stormproof - available in gray, black, red, wine, and two tone combinations with black sides. The culmination of over 15 years of development, Stormproof™ material is designed by Coverking and made by one of the world's leading textile mills. 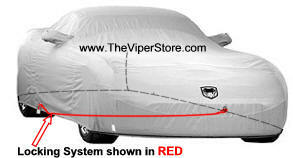 It is the most waterproof yet breathable car cover material available. 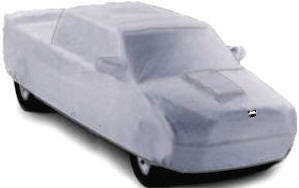 Stormproof™ car cover material exhibits outstanding sun and U.V. resistance, able to last for years in Arizona sun without fading. The micro-fiber base material is soft to the touch and won't scratch a car's paint - yet is rolls up into a very compact package for easy storage. Stormproof™ is available in colors, and embroidered Logos. Stormproof™ is unique in the field of Custom Car Cover materials in that it is Untreated, Uncoated, and Unprocessed. 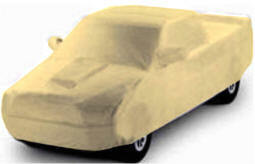 Through Coverking's advanced textile engineering, Stormproof™ accomplishes the needs of a premium Car Cover material without the coatings which can easily wear off, the treatments which fade over time, and the processing which can be undone the first time it is exposed to water. 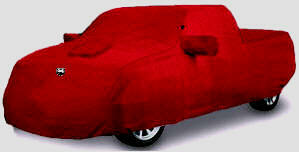 Speak to somebody who has owned other "premium" Car Cover materials and you'll hear how the other Car Cover fabrics work as advertised for the first few months, but then degrade in their water resistance - the problem is that the treatments and coatings can wear off, scratch off, or simply wash off. Stormproof™ is immune to this, because it is inherently water resistant. It has no coating, so it is very breathable. And the fibers have been designed to reflect UV rays, and be immune to the color fading caused by the harsh sun. 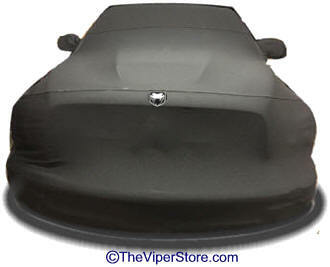 Stormproof™ is the only Car Cover material we can suggest for any climate or car cover need - it excels in every area except protection from dings. Stormproof™ will last for years, and compliment your vehicle with the exciting colors and two tone designs it is offered in. 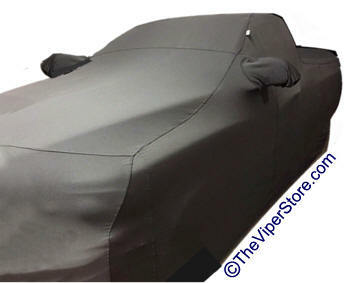 Stormproof™ Custom Car Covers are available only with Coverking's famous Custom Fit and the unique pattern designs which result in the fewest seams possible - Compare the images on the left. Coverking uses the fewest seams to produce a perfect, custom fit without the "patchwork" look created by sewing small pieces together. 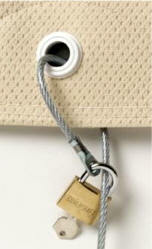 Although it costs more, Coverking's designs result in superior fit, looks, and less chance of seams failing or leaking. This is how Outdoor storm proof fits on a Viper vehicle. Optional - Choose your color cover and color of stripes! Call us to order this 352 688 8160 M-F. Highest Quality - Custom Fit to your RAM SRT10! Colored stripes available for additional cost. Optional NO logo - call us. NOTE: If you add stripes Viper head logo can not be added. 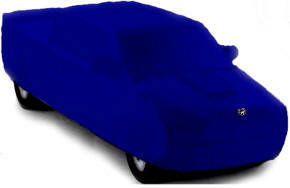 Coverking's Stretch Satin Custom Car Covers are made for vehicles parked indoors, and for owners who want nothing but the best for their vehicle. There is no alternative, available from any supplier, for this cover. Call or email your Coverking distributor and ask for a swatch of our Stretch Satin material, and you'll agree - the face feels like lingerie. 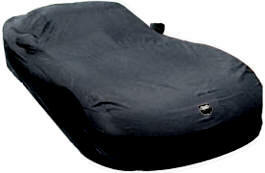 The material has Lycra fibers for stretch in both directions, mirroring every perfect contour of your vehicle. And the inner liner is the softest fleece we've been able to find - specially designed not to rub off on convertible tops. It is available in solid color designs, including Black, Steel Gray, Pearl White, Burgundy Red, Dark Blue, Fly Yellow, Tan, and Forest Green. the pattern to only three seams. All stitching is done using the blind stitch, hiding all thread. This is how Indoor satin stretch fits on a Viper vehicle. *Colored stripes available for additional cost. The Cable loops through the precut holes (grommets) on each side of bottom of your Car Cover pulling it taunt. Then locks it so no one can pull it off and steal it or it won't come off in a wind storm. Fits all of our Viper covers. 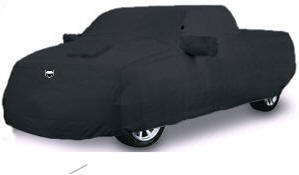 Stores your CoverKing Car Cover when not in use. Made from CoverKing’s patented Storm Proof material. Easily closes with Velcro. Available in black. Water resistant. 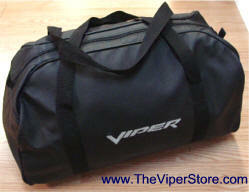 Optional "Viper" word logo on one side. 2-Dr Regular Cab 6 foot Short bed. Made of breathable Poly Cotton. Great for keeping the dust out of a stored RAM SRT-10. 4-Dr QUAD-Cab 6 foot Short bed.